Are you sick and tired of searching link after link to find a Pennsylvania County Map? Here is a handy and colorful Pennsylvania County Map complete with a list of Pennsylvania Counties and their Pennsylvania County Seats. I found myself getting awfully discouraged every time I needed to find exactly where a Pennsylvania County was located. Aren't you sick and tired of clicking from one website to another to find a simple answer to a simple question? Here's a link to a simple, easy to read Pennsylvania Road Map. And if you're thinking about travelling the turnpike here's a link to a Pennsylvania Turnpike Map . After all, what kind of service would I be providing you by telling you about all the wonderful Pennsylvania Attractions you could visit without helping you find them? Here is one of the easiest to read county map I could find. I hope you find it as useful as I have. 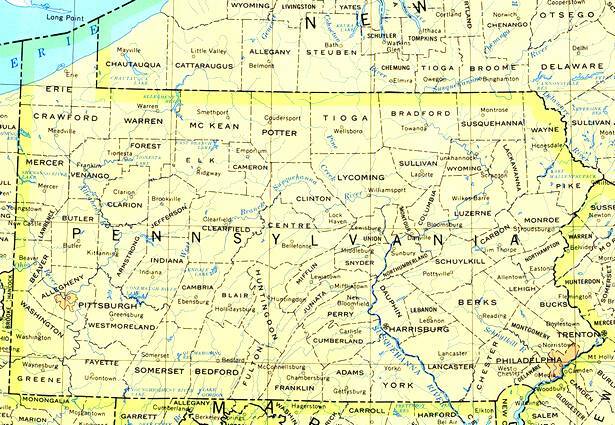 There is a total of 67 Counties in Pennsylvania. Each County has it's own County Seat. A County Seat is where the courthouse is located in each Pennsylvania County.